How to get there: From Ålesund, drive east on E-39. From Sjøholt, more precisely from the intersection where Hwy. 650 heads south just after Sjøholt, continue 12 more kilometer east along E-39. You drive by the road high point at Ørskogfjellet with public parking and start descending into the valley Skorgedalen. Find parking on the right hand side of the road just before the houses (on the left) called Bakkesætra. This is the trailhead, elevation 225 meter, location N62:33.199, E006:58.338. Route description: Cross the road and head up to the buildings at Bakkesætra. From here, continue uphill on the left side of the river Kvernaelva. The slope is reasonable and the vegetation causes few problems. As you reach the 400 meter elevation, the terrain is more level and there are reasonable spots where one can cross the river without trouble. Head north up among birch trees (a bit more cumbersome), until you leave the trees behind. Continue up the open slope below Sandfjellet (903m) towards the saddle connecting Sandfjellet with Trolltinden. A line that runs just below a pretty distinct boulder is reasonable. Beyond this boulder one may turn left and gain the saddle along a very broad, natural ledge. This saddle has an elevation of close to 780 meter, location N62:34.209, E006:57.503. From the saddle, follow the very broad ridge to the summit. 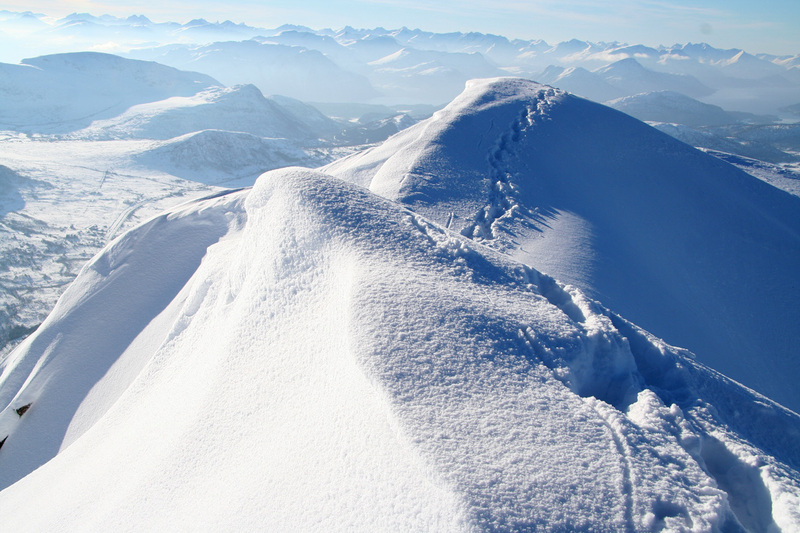 Initially, the ridge has two slightly steeper sections, then a more gentle slope as one approaches the summit. 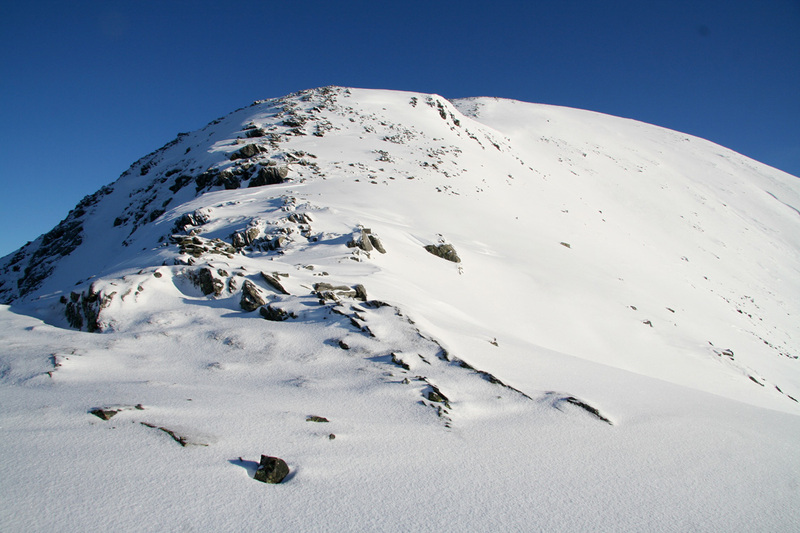 The very final section is a short, somewhat more narrow ridge to the summit cairn. Comments: I did this hike with my friend Arnt. We started from the car at 0915 and arrived at the summit about 3 hours later. After a bit more than 15 minutes with fabulous views and nice sunny weather, we headed back down. The slight breeze at the summit was not present on the slope and we made several stops for more photography and lunch. We were back at the car 5 hours after departure. This peak is indeed very nice and the feeling of being high up on a very prominent mountain is definitely there. 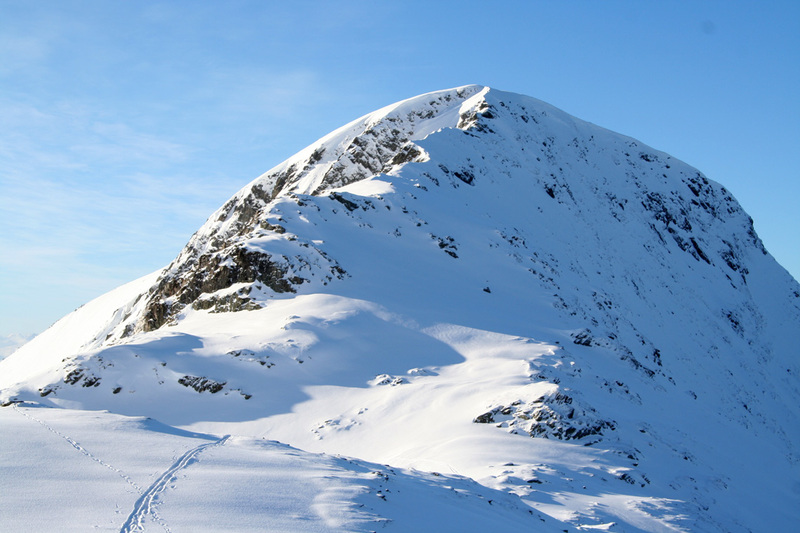 We also gave the connecting ridge to Sandfjellet a closer look. This ridge looked pretty narrow and somewhat difficult to climb with skis and a dog (Arnt's Troll came along) in the backpack. There is a gully just left of the ridge that might provide the best winter route to the summit, but we did not pursue these options any further. Trolltinden, as seen from the trailhead. 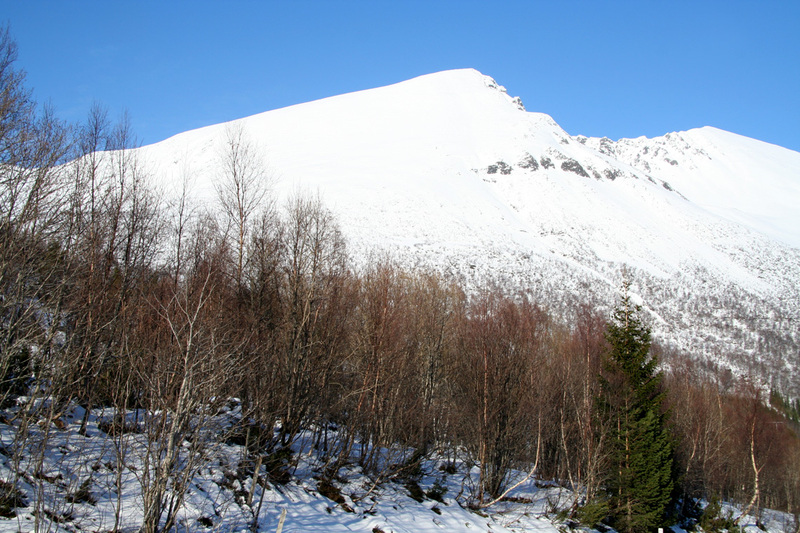 The ridge connecting to Sandfjellet. 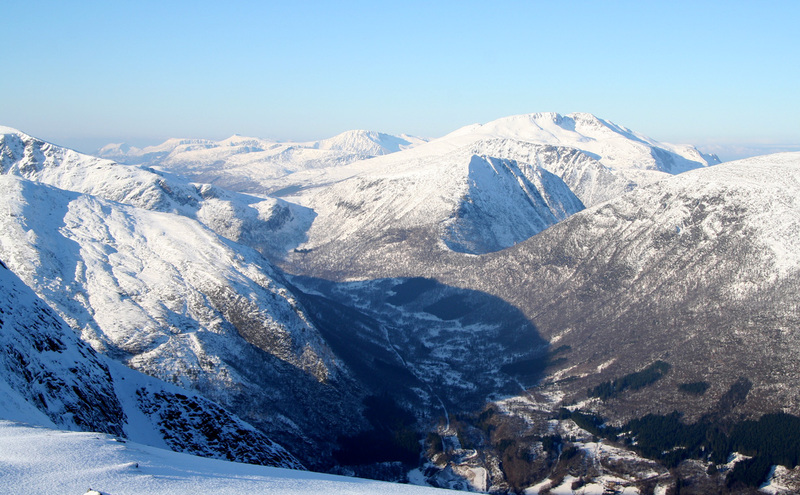 Frostaddalen, as seen from the saddle. The ridge as it starts out from the saddle. The last steps, looking back from the cairn. Arnt on Trolltinden, the view is east. Ytsetinden only 8 meter lower is just behind him. Valley view, Frostad, Tomra towards Selneset. Summit Panorama I. The view is north, the city of Molde is in clear view. Summit Panorama II. The view is northeast towards east. Summit Panorama III. The view is east towards south. Summit Panorama IV. The view is south towards west.